The latest installment in the Curious George movies was just as good as the other two. I remember reading the books when I was younger and even watching the cartoons on TV, so watching the Curious George movies with my kids has always been fun and reminds me of my childhood. This time George is going back to the jungle, but not on purpose. As our favorite monkey is as curious as ever on a mission to space, he accidently lands in Africa. While he's there he's exploring and making new friends while the person who loves him the most is on a mission to find him and bring him home. This movie is great for families with young kids, because it's not only a great story-line, it also has some catchy songs that will have your kids singing for days. 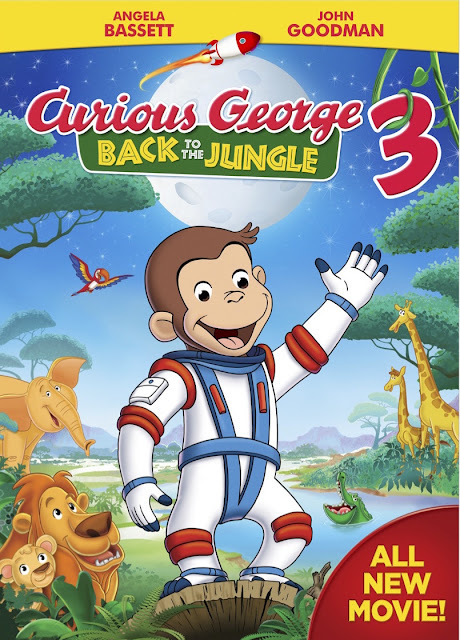 Curios George 3: Back To The Jungle is now out on DVD for you to bring home. Disclosure: All opinions are my own. I received a Curious George 3: Back to The Jungle on DVD at no cost for the purpose of this review. No other compensation was received.